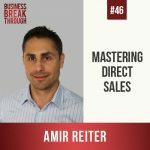 Amir Reiter is a master of sales, customer support and everything to do with building relationships. In this episode he teaches us how to make real money by nurturing your customers, making friends with competitors and enabling your staff to grow beyond you. If you want to learn how to maximize the human side of business, this episode is a must listen!